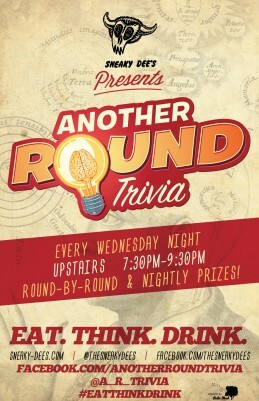 Dee’s Set To Host Another Round Trivia Wednesday Nights – Kicks off on April 2nd, 2014! We’re excited to announce that we will be hosting Another Round Trivia every Wednesday night from 7:30pm-9:30pm upstairs (doors @ 7pm). We will be kicking things off next Wednesday, April 2nd and you won’t want to miss it. So come down for the VERY FIRST Another Round Trivia Night on April 2nd and #EatThinkDrink ! Oh and don’t forget to stick around for What’s Poppin’ afterwords! There’s really no point of leaving anyways.